From chip level to room level, the thermal design of electronics has never been more important. Accurate computational predictions are a tool of primary importance in ensuring your electronic equipment operates within safe limits. On the component level, thermal models must accurately predict heat flux split between the board and the air or attached heatsinks, case temperatures, and junction temperatures, and even temperature variations across the die itself. Component placements and the design of the board itself strongly influence component cooling. Upstream components disrupt air flow over the board, leading to maldistributions, recirculations and hot spots on the board. Cooling can be enhanced by careful attention to air flow management across the board. On the enclosure level, electronics cooling is a challenge that begins with the ever increasing heat output of today's modern electronics, particularly for air-cooled electronics. Air flow is mean to cool the electronics but is disrupted by the internal geometries. Changes to either the enclosure or the electronics alters the air flow rate and distribution and consequently the cooling, making adding heatsinks as a design afterthought perilous. Correct sizing and positioning of fans, vents and heatsinks through optimization are system-level design tasks. Computational Fluid Dynamics (or CFD) has been adopted over the past decade for evaluation of thermal electronic designs with the above in mind. Early, design-stage optimization of component locations allows for fewer physical prototypes and a shortened design cycle. Models, as would be expected, are continuing to grow in complexity as tools and knowledge develops. Today's top-end modeling techniques have an astounding amount of physics builtin in, including variable fan rates, variable component electronic heat rates, conjugate heat transfer between air and solids, and a full material database including the latest isotropic and anisotropic materials. The figure below demonstrates thermal flow profiles through the open-source Zaius / Barreleye G2 server chassis. Mechanical stress is a key failure mechanism to consider when designing electronics systems. Excessive mechanical stress can cause cracking, rupture, fatigue, delamination, or even excessive deflection (such as in optical assemblies). Since most electronics systems are not also designed to be a part of the main mechanical load bearing structure, thermal expansion is a primary source of mechanical stress. CTE (coefficient of thermal expansion) mismatch typically comes to mind when discussing thermal stress, but high-temperature gradients also can cause differential expansion and excessive stress even when the materials are carefully chosen for the best CTE match. 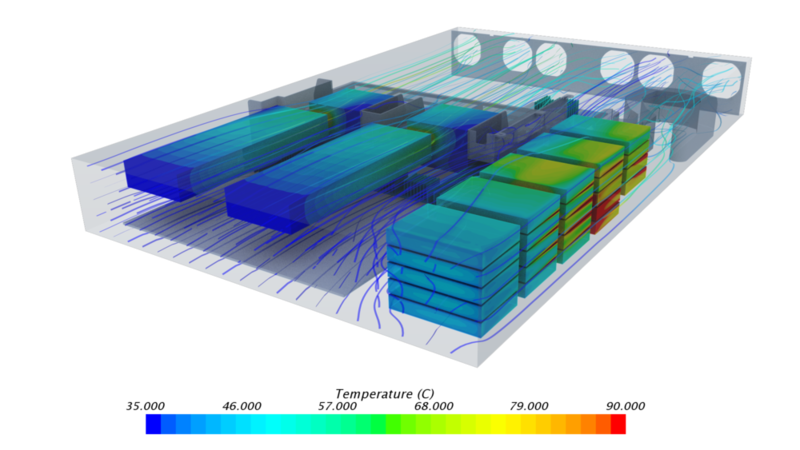 Simulation software now has the capacity to perform thermal stress analyses that discover these thermal engineering challenges prior to physical prototyping, saving time and money. The foundation for any thermal stress analysis is an accurate computation of conjugate heat transfer using Computational Fluid Dynamics, coupled with a finite element Computational Solid Mechanics solver computing stresses and mechanical loads.